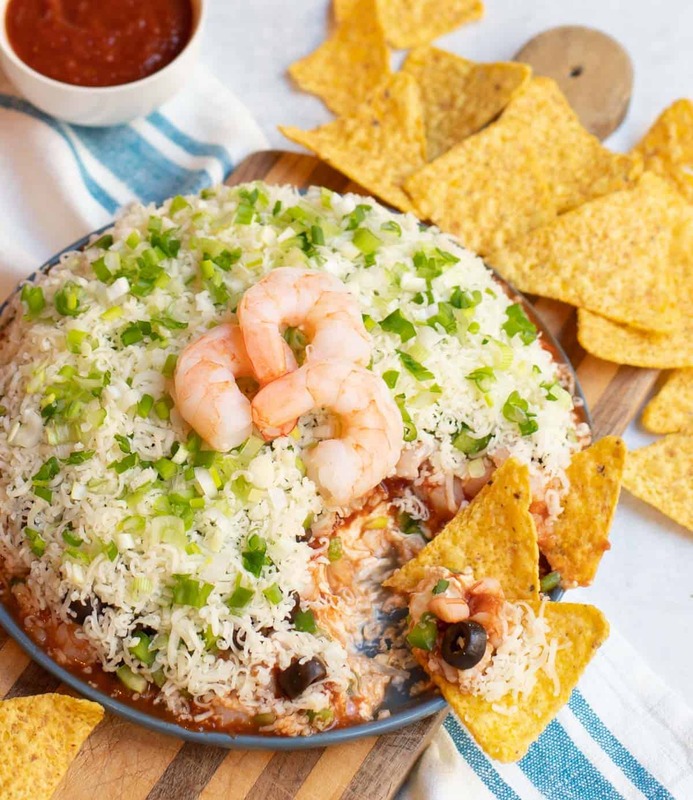 Layered Shrimp Cocktail Dip takes the iconic hors d’oeuvre and amps it up with spicy cream cheese, olives, peppers, onions and Mozzarella cheese. There are lots of theories as to the origin of the infamous hors d’oeuvre Shrimp Cocktail. Some say it was invented in Boston in the 1940s; others say it dates back closer to 1900 and was created by the head chef at Delmonico’s Restaurant in New York. No matter when or where it began, Shrimp Cocktail seems to be an everlasting, universally appealing appetizer, that shows up at both casual and formal gatherings. 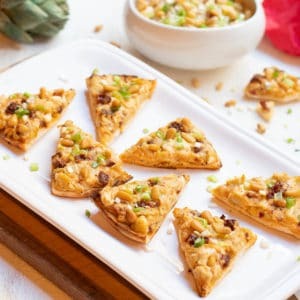 So, one day when planning for an upcoming party, I thought it would be fun to come up with a different dish that built on the flavors of the ever popular shrimp cocktail. Beginning with a yummy old shrimp appetizer recipe of mom’s that combined shrimp and cocktail sauce with spiced cream cheese and Mozzarella cheese, I played around with adding various ingredients that pair well with shrimp. 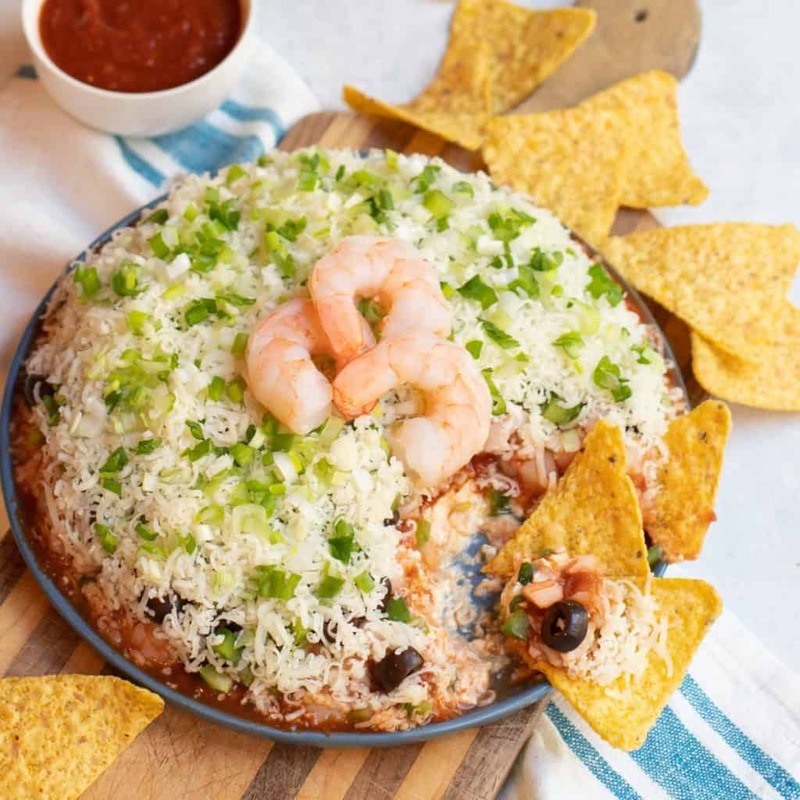 After a few tries, I ended up with this colorful Layered Shrimp Cocktail Dip that was a hit with Robert and our friends! Super easy to prepare, you simply layer the basic ingredients of cooked shrimp and cocktail sauce together with cream cheese that’s spiced with Worcestershire sauce, lemon juice, cayenne pepper and a bit of garlic. Sliced black olives and green pepper add flavor, color and crunch. To finish, finely shredded Mozzarella cheese and chopped green onion top it all off. 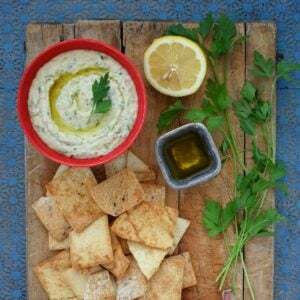 I like to serve it with tortilla chips – and a spoon! In a large mixing bowl, stir together the cream cheese, sour cream, Worcestershire sauce, lemon juice, cayenne pepper and garlic. Spread mixture evenly in the bottom of a 8 or 9-inch glass pie plate or rimmed serving dish. Spread 1 cup cocktail sauce evenly over top of the cream cheese mixture. On top of cocktail sauce, layer (in the following order) the shrimp, olives, green pepper, and shredded cheese. Finish with green onion on top. Garnish with 3 shrimp, if desired. Serve with tortilla chips and remaining cocktail sauce on the side. Make ahead: Can be prepared earlier in the day, covered and refrigerated. Bring to room temperature before serving.